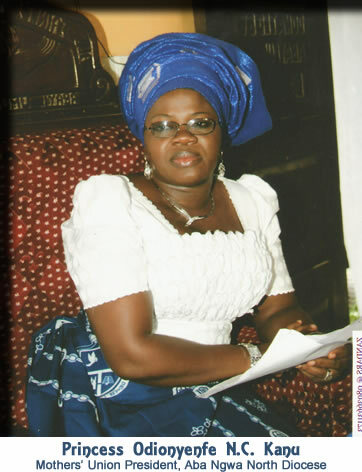 Odionyenfe N.C. Kanu (pictured left), the wife of the Diocesan Bishop of Aba Ngwa North Anglican Diocese. The Women’s Guild was founded by Mrs. Frances Melville Jones (wife of Rt. Rev. Jones, the Bishop of Lagos). It was inaugurated on 23rd May, 1921. The Women’s Guild reached Owerri Diocese in 1928. The organization was founded in order to cater for all the women folk of the Church who for one reason or another cannot join the Mothers’ Union. Hence, it is open to all Women who are full members of the Church. In this Diocese, Women must first become members of the Women’s Guild before they can seek to join the Mothers’ Union. The Rules of the Women’s Guild helps every Woman to understand what is expected of her as a member of the group. To read the Holy Scripture and pray everyday. To learn a verse from the Bible every week. To uphold the sanctity of Marriage and the upbringing of our Children and Servants in the Right way, and to teach them to pray everyday and every night. To avoid being Debtors, to avoid living corrupt lives and Drinking intoxicating wine, and to avoid speaking filthy words. To attend Church Services, Class meetings and Guild meetings regularly. Evangelism:- Helping People to discover Christ. To visit the sick, physically handicapped, the aged and the bereaved. O God our Heavenly Father, we pray you to bless every member of our Guild, cleans us with the blood of Jesus Christ our Saviour so that we may be cleansed from all our sins, bind us in love and prayer, help us to keep all rules of the Women’s Guild, make us trustworthy women and loving mothers. Help us to use all our efforts to make others know you that at last we may reach the heavenly joy, through Jesus Christ our Lord, Amen.